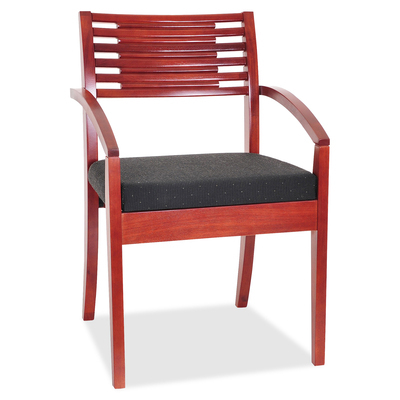 Guest Chairs Are Made With A Solid Wood Frame To Impress Your Guests And A Cushioned Seat To Make Them Comfortable. Curved Back And Sloping Arms Welcome Them To Relax While The Four-Leg Base Provides Elegant Stability. Seat Is Upholstered In A Black Fabric. Wood Frame Features A Cherry Finish. Each Chair Ships Assembled So It'S Ready To Add To Your Reception Area. Seat Measures 19-1/4" Wide X 19" Deep. Back Size Is 19" Deep X 8-1/2" High. Weight Capacity Is 286 Lb.. Guest Chairs Are Made With A Solid Wood Frame To Impress Your Guests And A Cushioned Seat To Make Them Comfortable. Curved Back And Sloping Arms Welcome Them To Relax While The Four-Leg Base Provides Elegant Stability. Seat Is Upholstered In A Black Fabric. Wood Frame Features A Cherry Finish. Each Chair Ships Assembled So It'S Ready To Add To Your Reception Area. Seat Measures 19-1/4" Wide X 19" Deep. Back Size Is 19" Deep X 8-1/2" High. Weight Capacity Is 286 Lb.